Home »Barn, Fence, and Arena Articles »Arenas »Want An Indoor Covered Riding Arena? Indoor arenas. We occasionally get to ride in them and the thought always runs through our minds of how nice it would be to have one, but owning our own indoor arena is out of the price range of most of us common horse folk. Sure, if you’re a professional horse person you can write it off as a business expense and that might make it a do-able proposition, but for most of us, there is no way we can afford the price of an indoor arena. Well, not unless someone pulls our lucky lottery ticket. However, it doesn’t hurt to dream. And sometimes thinking about the impossible is a lot of fun. Let’s pretend money did fall out of the sky. What kind of an arena would you build? Here are a few thoughts on different indoor riding arenas options. What is the Perfect Indoor Riding Arena Size and Dimension? You already know the answer – it depends on your needs and your budget. If you’re giving riding lessons or are a professional doing a lot of showing, you probably need a large 200 or 250 ft long arena. Most arena designers will recommend you build as big as you can afford – of course, that’s their job. One thing to keep in mind when you are juggling budget and desires is that adding width is usually more expensive than adding length. Depending on the discipline you ride, the size arena you need will be different. Below we will look at a few disciplines and arena sizes. Dressage arena size is 20m x 40m for a small arena or 20m x 60m for large arenas. Dressage Size Arenas – If you’re into formal dressage and want to be able to practice riding dressage tests to perfect your transitions and cueing, you will need an arena that is at least 66 feet wide. 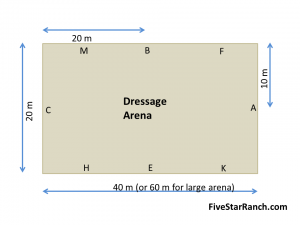 What is the size of a dressage arena? Dressage has two different lengths of arenas. A small practice dressage arena is 20 meters by 40 meters (that’s 66 ft by 131 ft). The standard large dressage arena (for shows) runs 20 meters by 60 meters (that’s 66 ft by 197 ft). Events that involve chasing cows down the arena need longer arenas. Most commercial riding arenas or team penning arenas are 120 ft by 200 ft. If calf roping is what you are into, you’ll need a 40 ft by 300 ft layout (or 70 ft x 240 Ft if you have a return chute). If roping is your thing, then building a long narrow arena may be fine, but be aware that these narrower arenas don’t have the resale appeal of a wider arena. Round Pens – A standard riding round pen has a 66 foot diameter. Breaking pens where you are only doing ground work can be smaller. Our first recommendation if you are struggling to see what you can “get by” with is to go ride in an arena in the dimensions you are planning to see how it feels. If that isn’t an option, then mark out an area in your pasture that duplicates the width and length and ride around in it. If you ride a good sized horse with a long stride you may find you need something wider than someone on a smaller mount. Normally, going at least 60 feet in width allows you flexibility. Much narrower can put a strain on your horse cutting sharp corners. If you are uncertain on what size you need, do the “test ride before you build” exercise. Mark off the dimensions of the arena you think you want in your pasture – you can use round pen panels, hay bales, pvc pipe or even rope or a garden hose. You just want something to delineate the perimeter. Ride in the area for a week. Do you feel too cramped? Do you need more room? A few days in your test arena should give you a feel for the size. We recommend this because we know several friends who spent a lot of money to build a nice arena only to find out they didn’t make it wide enough to ride in it comfortably. A couple other considerations to keep in mind is that bigger arenas are more pricey in hidden costs – you need more lighting, more footing, and more real estate to accommodate them. If you just want a place to get out of the hot sun a covered arena that fits a large round pen or maybe a 80 x 60 rectangle might be perfect. An arena in this size range is large enough to comfortably work the horse. If you live in a hot climate you may not need an enclosed arena, but instead a covered arena may be perfect – with no walls to impede air flow. The picture at right shows a covered round pen which provides shade but since it has no solid walls, it allows good air circulation to keep the ring cooler. I talked with the owner of the round pen in the picture. She lives in the Texas Hill Country where the summers are blisteringly hot. She told me the one thing she wished was different on her ring was that she wished she had extended the roof overhang out further to provide even more shade. Another option we have seen is to build a long arena but only cover part of it. This is an option if you are on a tight budget but really need a covered area to work in rainy weather. Would You Build a Barn-arena Combination or Separate Buildings? If avoiding the elements is your prime motivator for the arena, you might consider a combination arrangement where the barn and arena are contained in the same building. Several of my friends in Colorado have built small indoor round pens in parts of their barn so they can work in the winter when the wind is blowing ninety miles an hour. It is a special luxury to be able to walk from the tie stall to the arena in a snowstorm and not get a flake of snow on you. The ideal size for an indoor riding round pen has at least 60 ft diameter. You can go smaller, but be aware the smaller the circle the harder it is on the horse. If you go the combo route, you might want to include rubber or dust control arena footing in your budget. Also if you store hay in a combo barn you will also need to protect the hay from arena dust. The separate building option takes up more real estate, but keeps the dust confined to the arena not your whole barn. If you are holding shows at your barn you may prefer the separate building approach to keep stray visitors out of your barn. Would You Insulate the Roof? How about Fans? I’m a huge fan of insulated roofs, so its hard for me to be quiet on this one. I’ve ridden in several arenas in Texas in the middle of the summer and the insulated ones made it feel almost comfortable in the dry heat. The non-insulated ones felt like an oven. Another option you might consider is exhaust fans or gabled roofs that let hot air escape in the summer. In hot climates like Texas, most of the professional covered arenas have large overhead fans to keep the air moving in the arena. How About a House – Barn – Arena Combination? When coming up with their arena and barn design, some people opt to build a living area in their arenas. This is often found at professional barns where staff lives on the site. Some people go even further and build their house as part of their barn-arena-house plan. A few things to keep in mind if you’re thinking this route is that while this may be convenient and save you money upfront, barn homes don’t appeal to some people so it may be more difficult to sell. Okay, these are a few of the many questions you might ask yourself if you were going to build a new indoor horse arena. If you’re interested in footing, check out our article on horse arena footing considerations. If you already have an arena, you might be interested in our safety rules for indoor riding arenas.